All hard disks benefit from the process of ‘defragmentation’ whereby individual files are reorganised to occupy a contiguous area of the disk rather than being stored as numerous linked fragments. Fragmentation occurs because it’s practical to write new data in the first convenient space on the disk rather than copying the whole file to a space big enough to accommodate it. While this method makes efficient use of available disk space and is the quickest way to add file updates, the speed of access becomes slower over time as the files become more fragmented and greater effort is required to assemble the bits. In practical terms, most Windows users will benefit from a hard-disk defragmentation every few months though this obviously depends on individual usage. One useful feature of Windows Vista is that it is set up to carry out this process automatically though the ‘default’ setting for this seems to be at 1:00 am on a Wednesday morning when the equally-useful power-saving features of Vista are quite likely to have put the PC into ‘sleep’ mode. Sadly, if the scheduled time is missed, there is no automated facility to catch-up. The practical answer here is to change the scheduled defragmentation to a time when the PC is likely to be on―regular (daily or weekly) defragmentation will hardly be noticed by the user so it really doesn’t matter if some of the jobs are missed. If the PC has become noticeably slow due to fragmentation, the process could easily take an hour or so―older and slower PCs or those with little spare disk capacity could take several hours to defragment. The procedure for Windows XP is similar but no scheduling is available. During the last few days, I have seen two 'sick' Windows lap-tops whose poor performance was substantially due to lack of free space on the C: drive. In the first case, there was about 32 Gigabytes of free space on a separate, though unused, disk partition while the second machine had about 50 Gigabytes of information created by backup software whose presence was completely unknown to the user. The rather 'nerdish' thinking behind partitioning a single disk into separate 'logical' drives is that keeping the data separate enables you to perform a clean Windows re-installation without losing your live data. That's all very well in theory except that both software and data are likely to be lost in the event of a hard disk failure. The other problem is that most software is set up to save data on the C: drive, often in particular Windows folders (such as 'Documents' or 'Pictures') intended for the purpose. Several hardware manufacturers seem to deliver new computers partitioned in this way though rarely with any clear information on why this has been done or how to go about setting-up your software to redirect the data. Some people also seem convinced that separate partitions speed-up the computer operation though the logic of this is difficult to follow if those partitions are on the same physical disk. Backing-up files to the same physical disk will be useless if you suffer a disk failure and somewhat difficult to retrieve if the computer won't boot-up due to the corruption of Windows. In my opinion, you should always backup the entire system (not just the data) to a separate physical disk or other backup device. Until the release of Windows Vista, repartitioning a Windows system involved the use of specialist software such as 'Partition Magic'. In Vista, just find your way via the Control Panel to Administrative Tools, Computer Management and, finally, Disk Management. At this point, you can see a clear depiction of both the physical and logical disks (partitions). Each partition may be deleted, expanded or shrunk so you can easily delete any surplus partitions and expand the C: partition to take-up the unoccupied space. Do ensure that a partition is empty before deleting as any data will be lost. It is now fairly common for new computers to be delivered with a (relatively) small 'recovery' partition which can be used to reset the computer to it's 'delivery' state. This is not a substitute for proper backups as all data will be lost in the recovery and it won't work at all if the hard disk has failed. However, it's useful if you want to make a clean start or if you wish to sell the computer with all personal information removed—though some 'deeper' cleaning might be required for high-security situations. Today, one of my clients received an 'invitation' to download PDF9 which, as he put it, "appears to be a super version of Adobe". My first reaction was that one should always be wary of downloading software unless it is known to be from a very reliable source. PDF (Portable Document Format) is a file format originally created by Adobe Systems to provide documents which could be read on any computer using any operating system. To read a PDF file, all you need is the FREE Adobe Acrobat Reader which may be downloaded from the Adobe web site here Get Adobe Acrobat Reader. Unless you wish to create PDF documents, you don't need anything else. When I purchased a full version of Adobe Acrobat for about £400 several years ago, I imagined that it was some sort of full-featured word processing or desktop publishing package. In fact, that version basically converted existing documents created by other software in a (limited) number of formats—that's not all it did but that was the essence of it's operation. Rather than spending a similar sum of money on a 'Vista' version, I looked at the market for other PDF creation software and purchased eXpert PDF which currently costs €69 (Euro) from Visagesoft. This works in a different way by intercepting the ‘Print’ stream from any software application and it seems to work very well—though I only have an occasional requirement for this sort of conversion. Both Adobe (full version) and eXpert PDF can 'work in reverse' to convert from PDF to Word and some other formats.. If you only need to convert Microsoft Office documents, I notice that the 2007 version allows you to save them directly in PDF format. The current version of Adobe Acrobat (full version) is 9 though a quick Google search reveals a lot of other PDF9 products—to avoid downloading malicious software, be sure to download from the Adobe website or another known secure source. These days, it is almost impossible to purchase up-to-date software and the first priority with any new computer or peripheral device is to download the software updates. With most printers, scanners and other devices, I don't usually bother with the supplied CD and go straight to the manufacturer's web site where there is a fair chance of finding the most up-to-date software. Having recently purchased a new Windows Vista (Ultimate Edition) PC for my own use, I naturally went to the HP site to install my HP 2710 'all-in-one' wireless printer which had been working happily in partnership with my Windows-XP Professional machine for 2 or 3 years. Having duly downloaded a massive 163 megabytes of HP Officejet and Photosmart software, the printer worked fine for a couple of days when it suddenly 'disappeared' from my PC though it still worked perfectly well from the old XP machine. Initially, I misdiagnosed the problem as being related to the subsequent installation of my Epson Precision scanner which I purchased a while back for scanning photographs— the HP 720 series all-in-one I had at the time was just about OK for scanning photos but the Epson offered a much higher resolution with a backlight for scanning negatives and slides. Sorry Epson—it did cross my mind that installing your software might have knocked-out the competitive product. Having re-installed the HP software, everything was fine for a couple of days when the printer did it's 'vanishing act' once again. A quick 'Google' search revealed a number of users with this problem on various HP wireless printer models and further perusal of the HP site revealed a'critical update to prevent unexpected printer uninstall'. 'Touch wood', this appears to have solved the problem though it is a mystery why this 'fix' was not included in the 'latest' software or generated by the standard 'HP Update' routine. I have always found HP printers to be very reliable once they are successfully installed but it can take a lot of faffing about to get them working properly in the first place. Just do a Google search on 'HP Printer Problems' if you don't believe me. Nick was consulting me on the purchase of a new lap-top when he mentioned that his old Dell machine had gone 'kaput' and would not boot-up at all—typically, no backups had been done so his live data was at serious risk. My first thought was to attempt a start-up from a 'bootable' CD which would quickly determine whether the problem was with the hard-disk or some other component. The F2 Key is typically used to enter the system setup area before the Windows operating system loads—this enables you to change the boot sequence though most recent PCs are already set up to load from a 'systems disk' (such as the Windows CD), if present. If the hard disk is readable, it may be that the Windows system files are corrupt and can possibly be restored with a 'repair' installation—a full Windows installation will, in principle, overwrite everything on the disk. If the disk is readable but not accessible with your PC, it should be possible to take it out and use it on another PC—lap-tops are a bit trickier than desk-tops for this as the disk bays and connections are not so 'standardised'. If the disk is not readable, you are basically 'stuffed' but you will have learned a valuable lesson which is to perform regular backups in future. In this case, I managed to boot-up using a Norton Ghost recovery disk which is typically used to restore from a backup though it has some additional utilities to perform various disk operations. Nick's computer seemed to work OK, apart from the fact that the disk partition information had disappeared and the Windows operating system was not recognised—at this point, I was running the machine from a version of the DOS operating system contained on the Norton CD. The Norton software managed to recover a Dell DOS partition which had utility programs for testing the hardware, etc, though it appears that the utilities supplied with Ghost do not recover Windows partitions or any data that they might contain. There is plenty of software about which claims to recover deleted partitions and files though most of it needs a live Windows system to operate in—DOH!! Question—How is it possible to recover deleted files? This is all a matter of what is meant by 'deleted'. In a Windows system, the initial process of deleting a file simply moves it to the 'Recycle Bin' which is just a special Windows folder from which the file may be easily restored to it's original location. When the file is actually deleted, by emptying the Recycle Bin or running the 'Disk Cleanup' routine, the data still remains in place though all references to it are removed from the disk 'Directory'. The act of deleting files simply frees-up the disk space for future use and the data won't actually be deleted until other data is written over it—which might not happen for a long time if you have plenty of free disk space. If the data still exists on the disk, it is entirely capable of being read. After a few internet searches, I came up with Active@ Boot Disk which comes in DOS and Windows versions—both versions create a bootable CD which runs either DOS or a 'lightweight' version of Windows Vista. The Windows version can also create a bootable USB disk and has a more-comprehensive set of recovery tools. In this instance, I chose the DOS version due to it's lower memory requirements—like many older PCs, Nick's was purchased with the minimum 256k memory then recommended to run Windows-XP. Many of these 256k systems now struggle with running the much-updated Windows-XP. In the event, the DOS version successfully recovered the C: partition and it's files—using one of the Norton Ghost utilities, I was able to drag the required data files to an external USB disk before attempting a full recovery of the system. These data files were successfully transferred to Nick's new lap-top. Naturally, the lap-top still wouldn't boot-up from the hard-disk which would have been just too easy. Neither was I able to perform a successful 'repair' installation which would have left all existing programs and data intact—in all versions of Windows, trying to repair a corrupted system is a rather 'hit and miss' process which often fails. I was, however, able to perform a fresh Windows installation to produce a 'clean' PC which will be perfectly good for not-too-demanding applications such as email and simple internet browsing—any other previously-installed software which is still required will also need to be re-installed. Fortunately, all of the required software 'drivers' to match the installed hardware were available on the Dell DOS partition previously recovered. I did notice that the CD/DVD drive was behaving erratically, sometimes giving rise to the dreaded 'blue screen of death' —this may well have been the cause of the original problem and not a virus as we had suspected. Without wishing to labour the point, this recovery could have been done in about 10 minutes, without external assistance, if there had been a recent full system backup such as those produced by Norton Ghost or similar. This should now be a useful back-up machine. if supposedly-deleted data can be recovered so easily, this clearly raises a security issue if your computer falls into the 'wrong hands' for any reason—I will be writing a separate article on that subject. There are also a number of ‘niche’ search engines and directories catering for specialist areas such as science, aviation and medicine. Getting to the information sometimes involves a bit of ‘trial and error’ but becomes quick and easy with experience. Essentially, the search will match on these two words found anywhere on the web site—both must be present but not necessarily together. Actually, search engines have become rather more-sophisticated at judging what is required so this search, while producing a large number of results, would probably place those sites containing this exact phrase at the top of the list. Using "Quotes", I could refine the search to match the exact phrase rather than the individual words. Because this person is well known, there are bound to be lots of hits but the point here is to illustrate the basic principles of refining searches. Rather than messing with punctuation and logical expressions (AND/OR, etc) as I have done in this illustration, it is easier to click on the ‘Advanced Search’ link and generate the search statement by filling in a form which makes it very clear which words and phrases are being included or excluded. Always think of your search terms as individual words rather than a question and make every word relevant—computers don't (yet) have 'understanding' in the human sense so you won't get very useful results from an expression like: "please tell me about people who breed labrador dogs in the South of France or the Northern part of Spain"
The only relevant words here are breed, labrador, dogs, France, Spain and, possibly, South of France though I suspect that searching on that exact term would exclude a lot of relevant results. If you actually know the address of the site you are looking for, go to it directly by typing the address into the browser address box rather than firing-up Google, Yahoo or whatever and searching for it, as quite a lot of people seem to do. While this does actually work in many cases, search engines don't have details of every single web site and, even if a web site is specifically submitted to them, it may take a few weeks to appear in the listings. A search on the address is sometimes useful to see which other web sites refer to the one that you are interested in. The easiest way to transmit files over the Internet is to send them as email attachments. In Outlook 2003, for example, create a new message and click Insert / File from the top menu, select the file(s) you require and click the 'Insert' button. In Outlook 2007, select Insert from the top menu, click the 'Attach File' icon, select the file(s) you require and click the 'Insert' button (that's called, 'change for the sake of change'). Most email clients have a similar function. The major difficulty with this approach is that most Internet Service Providers (ISPs) impose a limit on the total message size which may be as low as 1 megabyte though a figure of around 5 megabytes seems more typical these days. Sadly, there is no consistency among ISPs on this issue and a given email account will sometimes be able to send a larger message than it can receive, or vice-versa. A related problem is that certain types of attachment may be intercepted by the ISP, local network server or email client. For example, .exe files are usually intercepted for security reasons and media files are often blocked as inappropriate for business users. Sometimes, a failure warning will be issued and sometimes not. An easy solution to this problem is provided by Winzip Courier whose simple interface allows you to upload files to temporary web space where it may be downloaded by the recipients who are automatically sent the relevant link. The FREE version of the service allows you to send single files (which may comprise multiple files zipped-up) with a maximum size of 100 megabytes and a total upload limit of 1 gigabyte per month. There are various paid versions of the service with much higher limits. At the time of writing (July 2008), Winzip are offering a FREE 2-week trial of the paid services. I find the free version more than adequate for my needs and, although I could operate a similar system using my own web space, it is just easier to use Winzip Courier who look after all of the 'housekeeping'. For many people, a major barrier to using the PC is the lack of basic keyboard skills. This may be remedied with training software such as the Mavis Beacon Typing Tutor (various versions, £10-£25 from Amazon) though the problem often arises from a lack of manual dexterity caused by conditions such as arthritis. Fortunately, after many years of experimentation, the power of the modern PC has turned ‘speech recognition’ into a feasible technology. Furthermore, modern speech recognition software enables you to dictate in a natural flow rather than Dalek-like pausing between each word. If you have a recent version of MS-Office, speech recognition is already built in to enable direct dictation into applications such as Word or Outlook. To improve accuracy, the software can be ‘trained’ to recognise your own voice by reading a number of passages—each training session takes just a few minutes and there are several to choose from. As with a normal spell checker, you can add to the dictionary if a word is not recognised correctly—the more you use this type of software, the better it performs. Results are generally improved by using a headset rather than a combination of microphone and computer speakers. A wireless headset is even more practical and allows for the traditional ’pacing around the office’ while dictating. In practice, most people will make a few corrections via the keyboard though voice recognition software generally offers a full range of voice commands to control editing. Personally, I find Microsoft Office speech recognition pretty good but more-demanding users should take a look at Dragon Naturally Speaking which offers a number of advantages including higher accuracy, a range of specialist dictionaries (medical, engineering, etc) and the ability to integrate with a much wider range of software. The traditional approach to transcribing large passages of text from paper documents was good old-fashion copy typing—although the ability to scan documents has been with us for some years, the result of the scan is actually an image rather than editable text. This is no longer an issue because Optical Character Recognition is now a mature software technology which can analyse the image to extract editable text with a very high level of accuracy. With the Microsoft Office Document Scanner, for example, text recognition is automatic so you end up with the basic image together with a text file which can be saved into Word or some other application. This feature can be found in the Microsoft Office Tools section, under Microsoft Office on the 'All Programs' menu—this feature is installed as standard with Office 2003 but not with Office 2007 where it needs to be installed separately from the Control Panel. Omnipage is a rather more sophisticated product whose main benefit is to preserve document layout and produce editable documents which look exactly like the original—ideal for such applications as reproducing forms to be filled in on the computer. The software can also improve the appearance of poor-quality originals; it recognises a number of languages and can turn the text into an audio file which may be read aloud by the computer. The recognition of handwriting is still somewhat experimental and the most successful implementations have been on PDA’s (hand-held computers) using special fonts which are written as individual letters. In fact, handwriting recognition is also built into MS-Office and is best used with a graphics tablet rather than attempting to write with a mouse. I think that it will be a while before any software can recognise my ‘joined-up’ handwriting. The easiest way for several users to share data and resources is through the use of a wireless (WiFi or 802.11) network. This is usually implemented with a central Wireless Router which controls communication between PCs and other network resources. For the ADSL broadband user, there are a number of combined Modem/Routers which also control internet connection sharing. Each ‘wireless’ PC requires a wireless network adapter, either an internal card or a plug-in device such as a USB adapter. Most wireless routers also provide connections to plug-in network resources directly using an Ethernet cable—any devices (printers, for example) attached directly to PCs may also be shared throughout the network—directly connected PCs require a ‘wired’ network card. Major names in network hardware include Belkin, BT Voyager, Netgear and Linksys. Of course, network access needs to be restricted so that it is not available to everybody within wireless range—typically, 100-300 metres though there are a number of new products, based on MIMO technology, which offer greater coverage although the specifics are somewhat difficult to pin down without actually trying them out. Connecting to a wireless network is simple enough—using the software installed with your wireless network adapter, simply scan for the available wireless networks, select from the list (or enter the name directly) and supply the password if required. For the mobile user, there are a growing number of WiFi ‘hotspots’ which may be used for internet access—locate them with a Google search. Despite being an ‘old’ technology, FAX is still a very popular method of communication. Incoming FAXes can be viewed on-screen and either deleted or stored directly on disk—no need to waste paper printing them out unless you really need a hard-copy. Documents prepared on the computer can be FAXed directly rather than printing them out and scanning them into a separate FAX machine. If you do need to FAX a hard-copy document, it can simply be scanned into the computer and FAXed from there. FAX software also provides additional facilities such as transmitting at a specific time or to a number of recipients—it can also be set to try multiple times if the recipient is engaged. 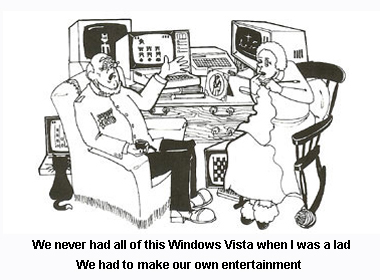 Both Windows-XP and Vista have FAX software built-in so there is no pressing need to purchase additional software—most PCs come with a FAX/Modem built-in but they only cost about £15-20 if not. Of course, using your computer for incoming FAX ties-up a telephone line and also requires it to be permanently on-line. I overcome this inconvenience by using a FAX-to-email service which is supplied by my Internet Service Provider (Plusnet) as part of their broadband package. The FAX is actually sent using an 0870 (National Rate) phone number to the provider’s server (in theory, never engaged) which passes it on to me as an email attachment—easily picked-up from anywhere with internet access. Independent FAX-by-email providers also offer sending services which are usually charged by the page—as an infrequent FAX user, I simply send from my PC using the phone line. For most home and small-business users, space is a precious resource which needs to be used with maximum efficiency. Although PCs are increasingly compact, they still tend to sprout a cats-cradle of wires supporting a myriad of external devices. Wireless networks go some way to reducing this clutter as do wireless keyboard/mouse combinations and wireless headsets. To my mind, the best space-saver is the multifunction (all-in-one) printer which combines the functionality of a printer, scanner and FAX—after all, the FAX is just a combination of scanner, printer and modem so why duplicate existing devices. Some of these devices can operate as stand-alone faxes though this is not essential if they are attached to a computer. Multifunction printers are now available based on either laser or inkjet technology, in both wireless and wired variants. For example, my Hewlett Packard Photosmart 2710 offers high quality colour scanning and printing with stand-alone or PC-based FAX—it has built-in wireless networking and can be directly connected to a PC or network via a USB port or Ethernet cable. It also has memory-card readers covering several formats—used, for example, to capture data and print directly from digital cameras. Being wireless, the device can sit anywhere on the premises unless direct FAXing is required in which case it would need to be near a telephone line. Links for product specifications and technical support are provided below but, as always, have a look at Amazon, eBay etc, for best prices. Last week, I took delivery of a new Dell Vostro Lap-top complete with the Windows Vista 'Ultimate' edition—there are actually several versions of Vista but, theoretically, the 'Ultimate' edition has everything on offer. Most reasonable people might expect a new PC to work 'straight out of the box' but, in practise, the process of setting-up is a bit like commissioning an aircraft carrier and can easily take several days. First task is to establish an internet connection so that the latest Windows updates may be downloaded and installed—it is all too easy to waste hours trying to resolve problems which are instantly fixed by the appropriate software download. For example, I had a problem in connecting the Vostro to my wireless network so I used a network cable instead—after the latest updates were applied, I was able to connect to the wireless network without difficulty. In this case, there were something like 50 'essential' updates to Windows and MS-Office software—for some strange reason, the 'default' setting of Windows Update is to download only updates to Windows but this is easily changed to include updates for any other Microsoft software, which makes a lot more sense. As some updates need to be installed before others, the easiest strategy is to keep running Windows Update until there are no more important updates available—the Windows Update process works out what needs to be installed when. A few installation failures and automatic system restores were pretty-much 'par for the course' but I managed to complete this task over several hours. I noticed, incidentally, that Dell had installed an 'update manager' which "checks for updated versions of the programs installed on your computer". Clicking on the update manager icon first generated the helpful message "an error occurred" without further information and clicking 'OK' to that took me to a screen which enabled me to check for updates—none were found which is rather confusing as the separate Adobe update manager subsequently downloaded a later version of Adobe Reader and the supplied trial copy of McAfee Internet Security usually replaces every module on completion of the registration process. Learning from past experience, I actually removed the trial version of McAfee and installed a retail version purchased separately—the retail version comes with a 12-month virus subscription and doesn't involve McAfee taking your credit card details to use for annual auto-renewal (whether you want it or not). One decision to be made was which firewall to use as both Windows and McAfee have one and they are likely to conflict if both active—as the Windows XP firewall only worked in one (incoming) direction, McAfee was definitely better but the Vista firewall works in both directions so I will stick with that unless I find some pressing reason to do otherwise. Firewalls can be a bit of a mixed blessing and sometimes block things without actually telling you—it is often useful to disable firewall and antivirus software when installing new programs. In my opinion. a great deal of the confusion surrounding computers arises from the fact that multiple items of software, with overlapping functions, are often installed. For example, when I first loaded a DVD, the Vostro booted-up Dell Media Direct even though the in-built Windows Media Player is quite capable of playing it. In fact, the Dell software was unable to play the first DVD I inserted (a 'freebie' from the Daily Mail) and urged me to change the region code of the player which would doubtless have generated further problems 'down the line' —Windows Media Player handled the DVD without complaint. It appears that, for legal and copyright reasons, some players only allow 5 changes of the DVD region code so a bit of 'trying this and trying that' could seriously reduce the functionality of your hardware. Looking closer, I see that my DVD region code is not set at all which seems acceptable to Windows Media Player but not to the Dell software—I was addressing the same problem for another client whose code is set to the wrong region, with no remaining opportunities to change, and this is not acceptable to Windows Media Player. It is useful to check that all of the hardware actually works as intended—for example, it is not unusual to buy a computer with a DVD player but no DVD 'decoder' software. Some versions of Windows Media Player included appropriate decoder software which then vanished when the player was updated via Windows Update—all very confusing. Much of the software installed on the computer will need to be 'activated' or 'registered'—MS-Office, for example, needed both on my new Vostro though it didn't appear necessary to activate Windows Vista itself. It's worth starting-up every program to get this stuff out of the way as these processes tend to generate security messages such as "Windows needs your permission to continue" which are there for your protection but can be quite confusing if unexpected. Finally, I installed software for Skype (internet telephony) and for my HP 'all-in-one' wireless printer—even if the printer is working with other PC's on the network, you still need the driver software on each PC that uses it. Having been though a few recent struggles with customer networks involving Vista, I seem to have 'got off lightly' with introducing a Vista machine in-house. Having overcome the initial problem of wireless connectivity, I was able to share both the internet connection and network printer with no problems. Access to Windows-XP files from the Vista machine required no specific setup though the XP machines had been previously configured for file sharing over the network. Accessing files in a Vista machine from another PC is a bit messier and essentially involves disabling the password protection which is set by default. An alternative strategy is to 'miirror' the user accounts and passwords on each 'sharing' PC. On this occasion, I didn't really have a requirement to move files and settings from another PC though it is easy enough once you have a working network connection. Alternatively, you can used a so-called 'easy transfer' cable which moves the data via USB ports. You can also use 'external' media such as DVD's and portable hard disks. The software used for the process is 'Windows Easy Transfer' which replaces the 'Files and Settings Transfer Wizard' provided in Windows-XP and some other Windows versions. The software is compatible with Windows XP and Windows 2000 but needs to be installed on non-Vista PCs. Personally, I prefer to use PC-Mover from Laplink which moves software as well as files and settings—that doesn't guarantee compatibility with Vista but is generally easier than digging out all of the original CDs and performing updates from internet sources which may no longer be available. Having taken several days to get the PC working as required, it would be silly to go through the whole process again. I noticed that Dell have provided a backup (D:) partition on the single hard-disk which is helpfully not mentioned at all in the on-line owners manual or any paper documentation—a trawl through the support web site reveals that this may be used to restore the PC to it's original 'factory' state which is quite handy though you would still need to perform the several days of setting-up and the aforementioned backup does not include any data (of course, if your problem had arisen from a hard-disk failure, you would be totally 'stuffed'). The answer is ongoing regular backups. As it happens, I am a great believer in backing-up the entire computer rather than individual files as most problems seem to arise from corruption of the systems software. Due to the limitations of the Windows-XP backup facilities, I have generally used Norton Ghost to produce a compressed disk image which can later be used to recover the system in the event of a complete disk failure. However, users of Windows Vista Business, Ultimate, and Enterprise editions can now do a complete backup & restore using external media so I used the Windows facility instead. The process was surprisingly quick (less than 10 minutes) with good data compression though it didn't seem to offer the option of only backing-up the main partition so it backed-up the Dell backup partition as well. Overall, I found the setup of my Vista lap-top relatively easy though there is still plenty to confuse the novice user and a lot of sitting-around waiting for stuff to download. Indeed, using a modern PC would be pretty-well impossible without a good internet connection. I recently had a call from a new client who needed some help with finding a lost file. As she has already explored the obvious hiding-places such as the recycle bin, I offered to have a look using remote assistance. She then mentioned that she couldn't use the internet and the phone at the same time which was a bit surprising as she was using an ADSL broadband service whose great advantage over dial-up, apart from speed, is that you can do just that. In fact, she already had the solution to hand in the form of the microfilters which came with her ADSL Modem. The microfilter (or 'splitter') separates the voice and data signals on the telephone line and you need to put one on each extension that you intend to use—if you don't, the voice and data signals are likely to interfere with each other. The microfilter plugs into the phone (or extension) socket and there are normally two sockets on the microfilter so that both phone and modem can be used simultaneously on the same extension. In this case, the client had a microfilter plugged-into the basic phone socket supporting the ADSL Modem but not into the extension socket supporting the phone. I have also noticed that deterioration of the phone or internet service can often be cured by replacing the microfilter—they are very cheap and new ADSL modems/routers usually come with a couple in the box. This morning, I received an urgent phone call from George who was having some difficulty in composing a French-language email as the letters with accents and other special symbols do not appear on English-language keyboards. Somebody at work helpfully suggested that he should enter ASCII codes for these characters without mentioning how this might be done or where to find the appropriate codes. Being quite 'mature', George vaguely remembers a fellow called Arthur Askey who went round saying things like "Hello playmates!" and "Ay Thang-Yew" but was not particularly noted as a computer pioneer. Those of a nerdish tendency can indeed use the various keyboard 'modifier' keys (ctrl, alt, etc) in combination with one or more other keys to produce special characters. Unfortunately, there are also a number of key combinations or 'shortcuts' which execute various software commands—so erroneous key-combinations can cause great confusion. French people, of course, use a French keyboard which would be a good solution if one were working mainly in French—I personally find it rather inconvenient to cope with the different positions of some essential characters like the full stop which is needed for web site addresses. However, there is a perfectly simple alternative if you use Microsoft Word as your email editor—simply click INSERT/SYMBOL when typing your message and up springs a table of the special symbols associated with the font that you are currently using. Here are some of the special symbols available with the Arial font—è é ? á â ç © ? Helpfully, the most recently-used symbols are listed in a row at the bottom which removes the need for scrolling through the entire table every time. So you can easily handle French, German and various other languages without becoming a nerd. PS Use the http://babelfish.altavista.com for free translations between several common languages—it's not as good as a human translator but usually adequate to convey the gist of the message.